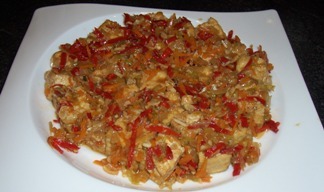 You can make a lot of dishes with tofu and spicy tofu is one of them and it is not difficult to make. It’s pretty easy. And the preparation time is not really that long, it’s takes about 30 minutes and your meal would be ready for the whole family. If you know the right way to make the tofu ready for your meal, you’re really get the most of delicious tofu meal and they are healthy and low of fat. Shall we begin with the recipe? Fry the small and cubed tofu until dry. Set aside. Fry the garlic and onion in the heat oil until fragrant. Add Red chilies, Birdseye chilies, carrots, and cucumber. Stir it until they mix well and fragrant. Add the fried tofu and a little bit water. Add bouillon powder and salt. Stir it occasionally.